Where most people see chicken as a boring piece of poultry, I see a canvas for creativity. One of my favorite things to do with chicken is to STUFF it ! An old classic I go back to allot is filling the chicken with cheese and ham then baking it in a sea of lemons and broth. It’s flavorful and truly adaptable to anyone’s preference on fillings and not to mention super simple. Lemon – Sliced up – Then those slices cut in ½. (2) Pieces of Boars Head Low Sodium Ham – Don’t get cut too thin. *When stuffing the chicken each piece should be cut in ½ so you will then have four pieces total to work with. (2) Pieces of Boards Head Provolone – Don’t get cut too thin. – Pour the white wine and the chicken broth into the dish. – Sprinkle the garlic, lemon slices and rosemary all over in the dish. – Wash and clean the chicken breasts of any fat or nerve. – Season the chicken breasts by tossing them around in a bowl with a sprinkle of salt, pepper and the garlic powder. 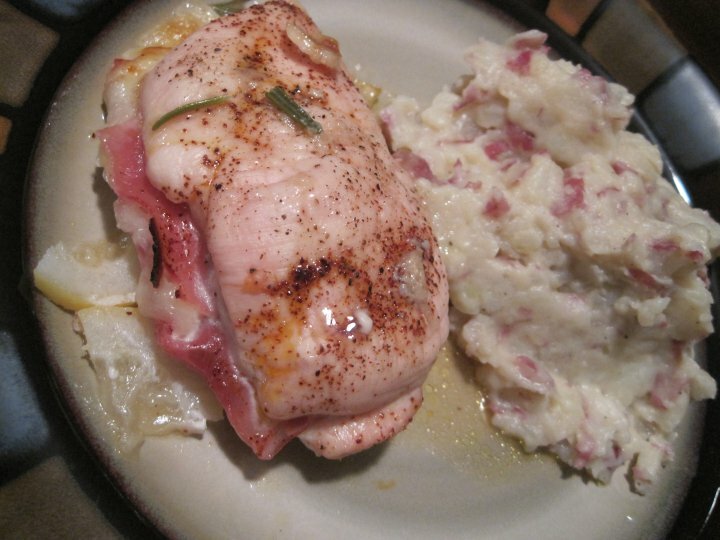 – Filet the chicken breasts down the middle but do not cut all the way through. – Open each piece of chicken like a book and lay flat on a cutting board. – Take one piece of provolone and lay onto the right side chicken piece. – Take one piece of ham and lay onto the right side of chicken piece. – Repeat the above two steps until in total there are (2) ham and (2) cheese pieces stacked on the right side chicken piece. – Now fold over the left side onto the right side so the “book” is now closed and the cold cuts are stuffed into the breast. 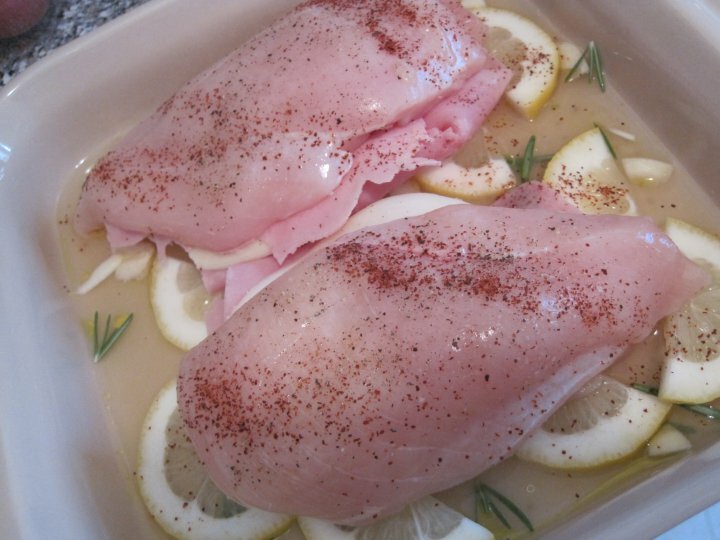 – Now lay each stuffed breast piece into the baking dish. – Take the two ½’s of the whole lemon and squeeze the juice from them all over the chicken and into the liquid in the baking dish. – Sprinkle some paprika on top of each chicken breast and then drizzle some olive oil over the top. – Place the backing dish in a pre-heated oven at 375 degrees and cook for 40 – 60 minutes or until chicken is cooked through. – Be sure to drizzle some of the juices from the baking dish onto the chicken when serving. *You can always swap out the ham for asparagus or roasted peppers. I’ve done salami, provolone and roasted peppers and it was delicious. I kept the lemon out of the picture though and swapped out the white wine for red and kicked up the baking liquid with more garlic and hot pepper flakes. *The photo you see here I served homemade red mash as the side but you can serve with roasted potatoes, a mixed tomato salad or even wild brown rice.